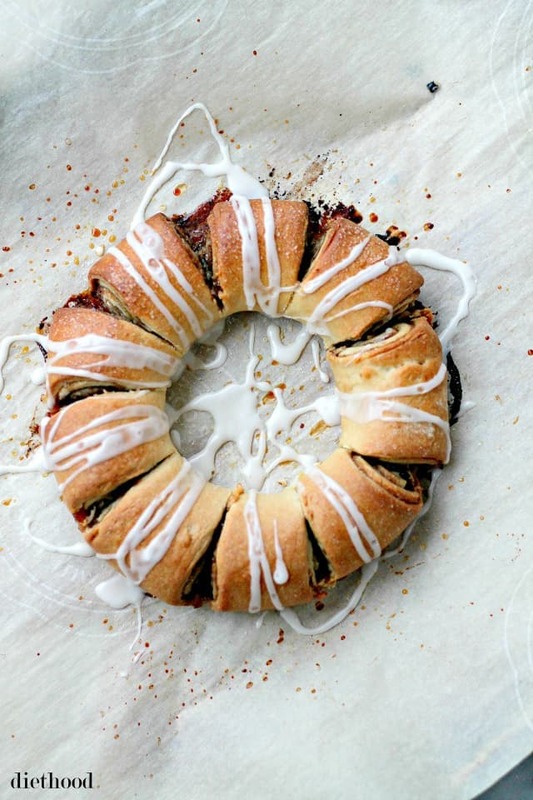 Cinnamon Roll Wreath – Festive, beautiful and delicious Cinnamon-Roll shaped into a ring and decorated with a sweet Vanilla Glaze. Welcome back, Friday! Always happy to see you. Even happier to see you, my beautiful friends! I have a major issue at the moment. It’s food. I want LOTS of it. It’s a thing that happens every year, one week before December, and it continues up until February. More specifically, I just want sugar rolled up in dough with a whole lotta butter and cinnamon. Whomp Whomp! 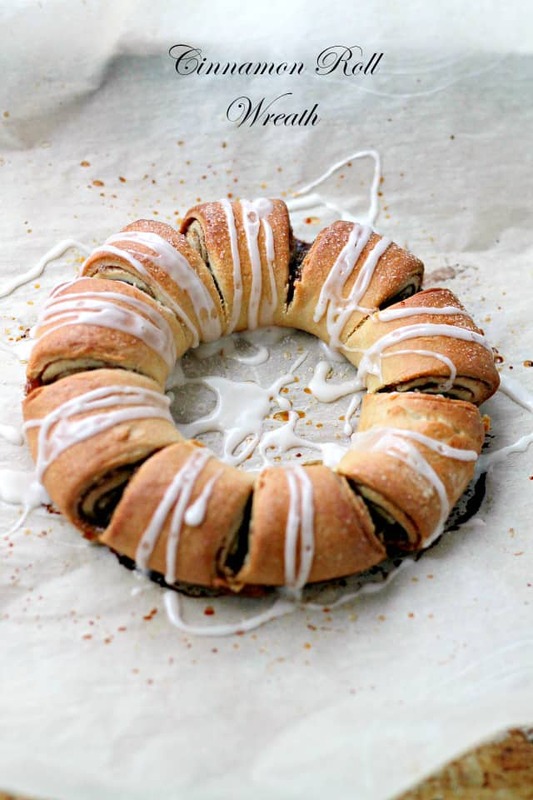 When I set out to make this Cinnamon Roll Wreath, I thought I was being all cool and helpful making some festive foods to share with my invisible internet friends, but it turns out that this whole Cinnamon Roll Wreath ain’t nothin’ new! 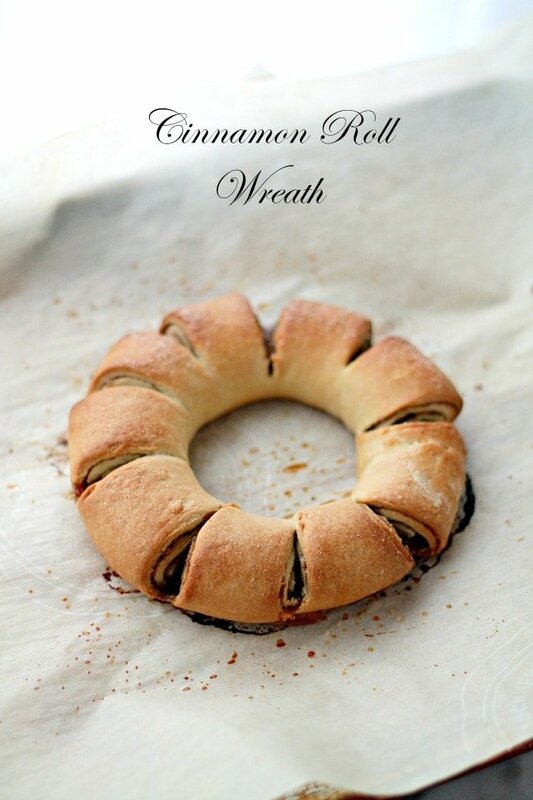 See, because I grew up in a house where Macedonian food was the only thing served day in and day out, sometimes I really ain’t in the know about clever food-wreaths and Elf on the Shelf-things. SO, as I was watching Home Alone for the bagazillionth time in my life, I had this idea about spreading some Nutella on a loaf of French Bread and just going at it. I kinda stopped from going ahead with the idea since, you know, it’s a bit much. Instead, as I talked myself into grabbing two slices of WHOLE GRAIN toasted bread and a cup of tea, a light went off and I was game. I grabbed my rolling pin and got to work. Here’s the deal. Since it’s Friday, this should totally happen in your kitchen tomorrow morning. Also? The good news is that this is WAY awesome! The bad news is that I burnt it on 3 different occasions because my oven and I are not on the same page. Totally worth it, though. However, that beast of an oven is getting its own oven thermometer, asap. The better news is that there’s not that much work involved here. Prep time is about 20 minutes, and that includes mixing, rolling, filling. 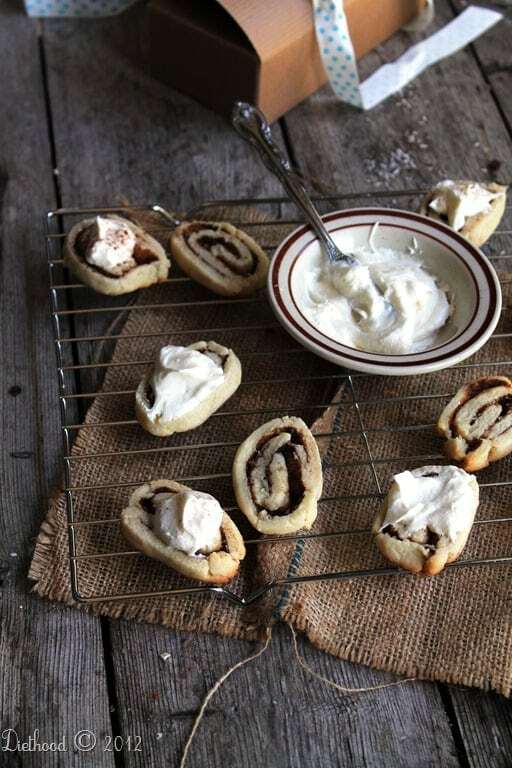 Spread some buttah and cinnamon-sugar all over it and your (my) life will be complete. In your mixer's bowl, combine yeast, sugar, salt and water; mix on low just to combine. Add 1/2-cup flour and softened butter; mix until blended. Add remaining flour and continue to mix for 2 minutes. Grease a large bowl with oil; transfer dough to the bowl and turn it so to coat with the oil. Cover with plastic wrap and a kitchen towel; set aside and let rise for 1 hour, or until doubled in size. For a faster rise, it helps to set the bowl on top of a warm oven. Transfer dough to a lightly floured working area and punch it down. Roll out the dough to a 12-by-16 inch rectangle. 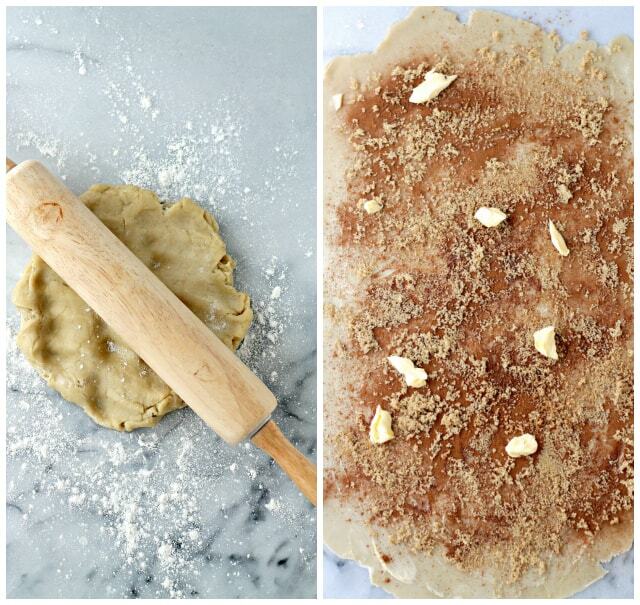 Using your fingers, spread 2 tablespoons butter over the dough. Sprinkle with light brown sugar. Add small pieces of remaining butter over the filling. 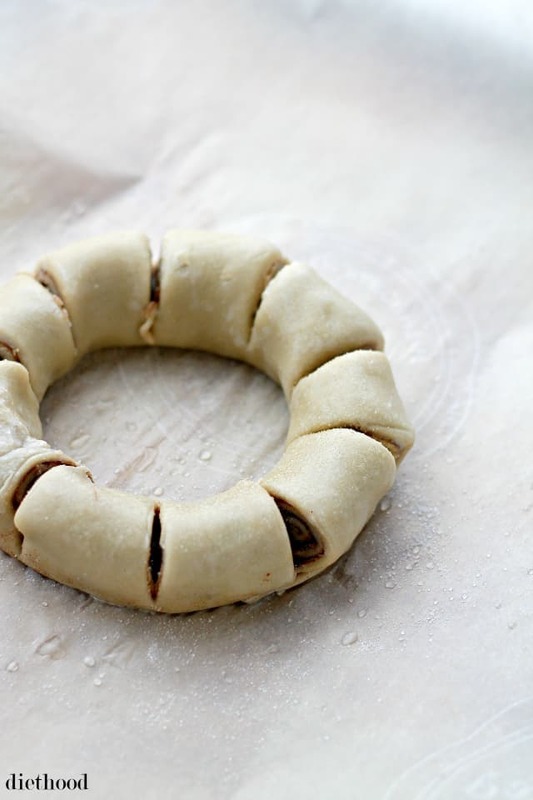 Begin to roll the dough away from you; roll it tightly into a log. Grab the ends and bring them together to form a ring; pinch the seams together. Cutting partially through, slice the ring into 1-1/2 inch slices and set aside. Prepare the egg wash by combining egg and water in a small bowl; whisk lightly. Brush the ring with the egg wash.
Bake for 30 to 35 minutes, or until golden brown. In the meantime, prepare the Vanilla Glaze. 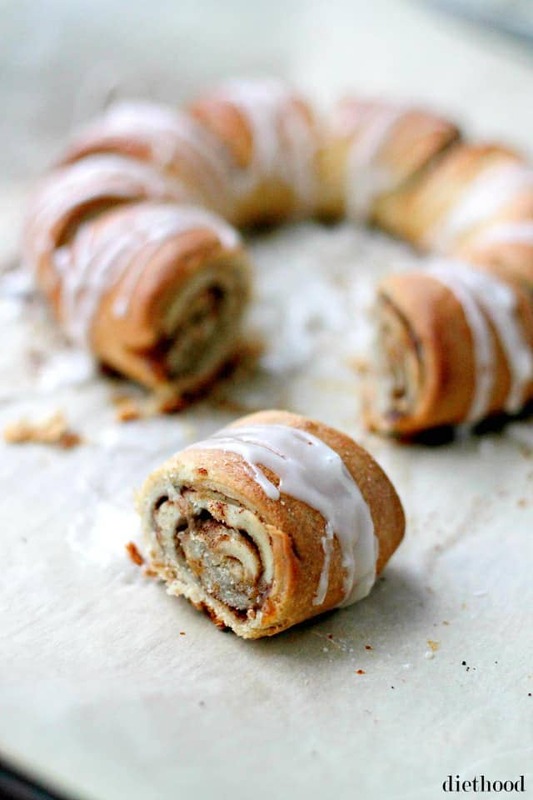 Remove Cinnamon Roll Wreath from oven and let stand a few minutes. I’m also sharing this with TidyMom’s I’m Lovin’ It Link Party! I adore this! So cute and perfect for Christmas morning breakfast. Stunning wreath! Your pictures are amazing and I imagine it tastes amazing too! This is beautiful and so festive! This is gorgeous but even more importantly it looks super yummy. Beautiful Katerina! That filling and glaze looks amazing! I love any kind of cinnamon roll/bread thing and this looks delightful – maybe my choice for Christmas morning this year? Thanks! What a fun idea for breakfast! LOVE this. Also, I am a huge Home Alone fan — one of my favorite holiday movies ever! This is gorgeous and the perfect celebratory breakfast! I feel like my oven and I are never on the same page. How is it possible that somethings cook faster than I think and others slower??? 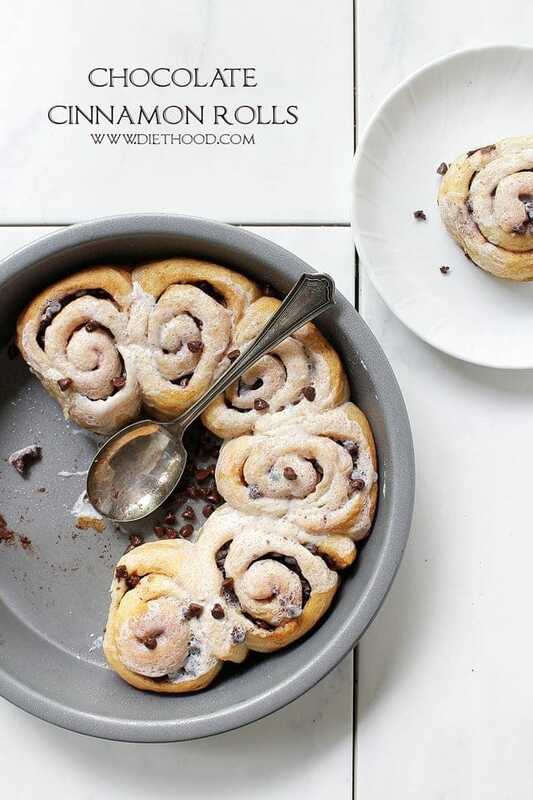 Cinnamon rolls have never looked so fine and that glaze – pure heaven! What a fun idea! We are a family of cinnamon roll lovers, so I knw this wreath would be a welcome addition at our table (and in our bellies). Looks perfect for Christmas morning. 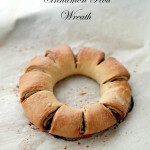 Gotta love an edible wreath! What a great addition to a brunch or breakfast buffet. Holy moly you always entice with your baking and photography. Luring us all in. 🙂 Delicious looking loaf! If this is what comes from watching Home Alone a million times, then I say keep watching because this looks amazing! Now that is my kinda wreath! Gorgeous as always.